We post a lot of videos on Jalopnik, but you'll notice we seldom — if ever — post videos from street races that people send us. We just don't think it's something to encourage or celebrate. Stories like this one explain why we feel the way we do. 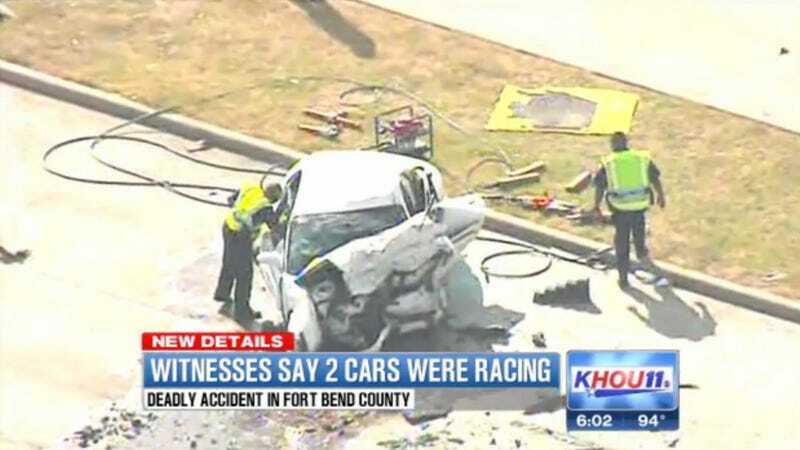 Houston's KHOU reports that a 29-year-old man was killed last week when his vehicle was struck by one of two cars that police say were racing on Highway 90 near Beltway 8 in nearby Missouri City. A witness said the cars were weaving in and out of traffic, and one was moving at an estimated 100 mph. One of the drivers crossed into oncoming traffic and hit two other cars, resulting in his death, the station reported. His car crashed into 29-year-old Karambir Chahal, who the TV station reports was driving home to celebrate a promotion that had just happened at his marketing job. The comments on that story describe Chahal as having been recently married. I couldn't find any details on what happened to the other driver who was said to be racing. You want to get your speed fix? Do us all a favor and do it at the track.